This is part 2 in our small-business story, which talks about all the factors leading up to opening Branches of Life in 2013. You can catch part 1, “The Story Starts Here”, by clicking here. 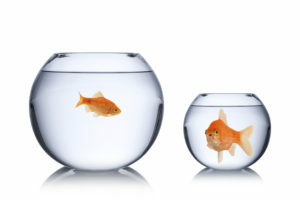 Teaching self-contained high school special education is not an easy job, but maybe not for the reason you’re expecting. It’s never the students—it’s the structure itself. It’s difficult to be optimistic in a space that feels confining, and everything does, and will, I think, until full-inclusion for all people is a reality. My experience with self-contained was to operate just beside but never exactly like the rest of our peer group, and due to the lack standardized or recommended curriculum, I felt that too many decisions about what my students would be learning was up to my opinion and judgement. That’s a lot of pressure and I don’t know how well that I did to get it right – because there aren’t a lot of guidelines available just yet. I spent a lot of time finding teaching instructions in research articles about experiments done with tiny population samples of people with significant disabilities. I’m a self-professed data dork and I love getting deep in research to find new ideas—but if we’re talking about how to teach literacy skills to a person with a significant disability, it’s a bit daunting to realize that there isn’t much out there by way of readily accessible resources. Almost everything I used as a teaching tool was imagined and created, by hand, by me or possibly a trusted colleague that was able and willing to share their ideas. Those relationships are incredibly valuable. The same concern echoed in my colleagues as well – what resources are available? How do you do this? What does it look like with this group of people? How do you measure progress when you can’t exactly administer a test or even necessarily give written assignments? How do you differentiate instruction so that wildly different people with different needs, all in one classroom (under that self-contained disability based criteria) can get what they need? There is also the constant professional paradigm shift between the focus on academics and functional skills for people with significant disabilities. Depending on which years’ educators went through teaching certification, foundations and focuses vary wildly. There is also the differing opinions about age-appropriateness. Some professionals believe that skills should be taught in a sequence – that the alphabet has to be mastered before reading instruction can begin, or that counting to 10 must happen before any other mathematical practice can be introduced. Other professionals believe in the practice of introducing a wide range of age-appropriate content, modified for current ability level, and watching to see what sticks or what the learner shows an interest in, and then build from there, without regard for those foundational skills. Ask 10 special education teachers their opinions on these issues and get 10 different responses. In such a rapidly changing field with so much by way of new ideas, more progressive societal beliefs, a public interest in the marginalized population of people that we work for, and technological breakthroughs to help make access issues more affordable, it is so hard to pin down the right technique or curriculum. I rely almost exclusively on evidenced-based practices to make decisions and deliver instruction. These are techniques that can be considered tried and true – if you teach using one (or more) of these methods, and you follow the directions explicitly, growth and learning is very likely to occur. On the other hand, if you are attempting to teach a person a skill or task without using one of these methods, all bets are off. This means that either that method has been tested and it doesn’t work, or that method hasn’t been tested. The best bet is to stick evidenced based. 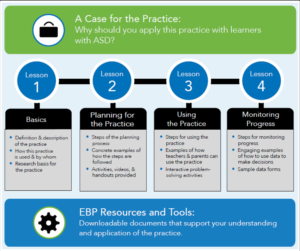 Usually, you hear evidenced based practices surrounding teaching strategies for people who have autism, but it’s fine to err on the side of caution and adopt these practices for people who are excluded from the typical styles of learning – at least until we hear something different. 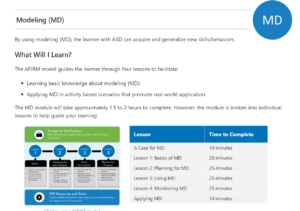 I keep a couple of bookmarks right in my browser that I refer to all the time — The National Professional Development Center on Autism Spectrum Disorder has an incredible resource of a collection of the most current evidence-based practices. Another resource that I like a lot is the 5 Minute How-To Video Series from VCU’s Autism Center for Excellence. 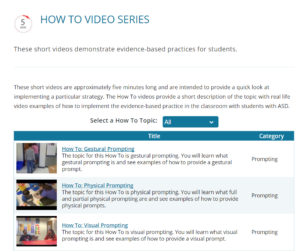 They offer 5 minute videos demonstrating evidence based practices, so you can see it in action. I had the opportunity to do my Master’s degree in Adapted Curriculum / Significant Disabilities through VCU, and was exposed to a variety of cutting edge ideas and research that prove how possible learning is for all people, and showed me ways to access learning through the use of evidence based practice. 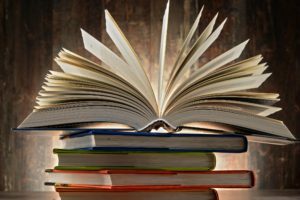 This reliance on research and journal articles and creating your own / paving you path ties in nicely with our small business story. If you missed it, you can read part one by clicking here. Do you have a favorite educational resource? I’d love to hear about it on our Facebook!